The coat of arms of the Republic of Kosovo[a] was introduced but not yet formally adopted following the unilateral declaration of independence from Serbia, issued by Kosovo's parliament in the country's capital on February 17, 2008. 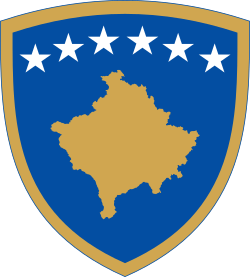 It shows six white stars in an arc above a solid golden shape of Kosovo as seen on a standard projection map, placed on a rounded triangular shield with a blue field and a golden border. Its central figures, the stars and the shape, are also the content of the new blue flag of Kosovo, already adopted at the same time. The Approved Logo of the Provisional Institutions of Self-Government. The United Nations mission in Kosovo (UNMIK) established an approved logo for the Provisional Institutions of Self Government in July 2003. UNMIK regulation UNMIK/REG/2000/30 (May 20, 2000) "ON STAMPS AND HEADINGS OF OFFICIAL DOCUMENTS OF COURTS, PROSECUTORS’ OFFICES AND PENAL ESTABLISHMENTS" states that the seals and letter heads of courts and penal establishments should contain "The emblem of the United Nations with “UNMIK” added to the top of the emblem" and the word "“Kosovo” in Albanian, Serbian and English"
ADMINISTRATIVE DIRECTION NO. 2003/15(July 2, 2003) "IMPLEMENTING UNMIK REGULATION NO. 2001/9 ON A CONSTITUTIONAL FRAMEWORK FOR PROVISIONAL SELF-GOVERNMENT IN KOSOVO" Establishes an "approved logo" for the Provisional Institutions of Self Government. Wikimedia Commons has media related to Coats of arms of Kosovo. 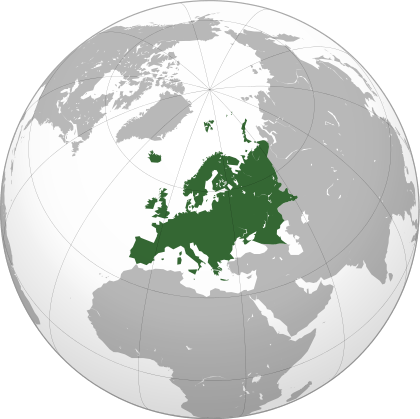 This article is issued from Wikipedia - version of the 4/1/2015. The text is available under the Creative Commons Attribution/Share Alike but additional terms may apply for the media files.